MOSUL, Iraq (AP) — Airstrikes, shelling and other heavy clashes shook a small sliver of western Mosul on Tuesday in renewed fighting, a day after the government declared victory over Islamic State militants in Iraq’s second-largest city. Amnesty International, meanwhile, proclaimed the battle for Mosul to be a “civilian catastrophe,” with more than 5,800 noncombatants killed in the western part of the city. 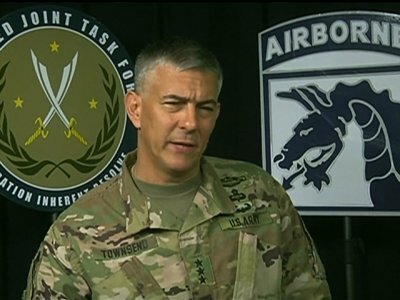 The top U.S. commander in Iraq rejected the group’s allegations, however, that the U.S.-led coalition violated international law. On Monday, Prime Minister Haider al-Abadi declared “total victory” in Mosul, flanked by his senior military leadership at a small base in the city’s west. A statement late Monday from IS said its fighters were still attacking Iraqi troops in the al-Maydan area of Mosul’s Old City, purportedly killing and wounding many and seizing weapons and ammunition. In Baghdad, Shiite politician Karim al-Nouri echoed those remarks, urging the government to review its policies in Sunni areas of Iraq to “avoid previous mistakes that led to the emergence” of IS. The government needs to work on “removing fears of marginalization and terrorism affiliation in Sunni areas,” said al-Nouri, a senior member of the Badr Organization. He said he believes Iraqi forces should stay in Mosul until it is fully secure before handing control to local forces. Lawmaker Intisar al-Jabouri from Nineveh province, where Mosul is the capital, said uprooting IS’ “extremism ideology” was the key to peace in Mosul, which reeled under the group’s harsh rule for three years. “The scale and gravity of the loss of civilian lives during the military operation to retake Mosul must immediately be publicly acknowledged at the highest levels of government in Iraq and states that are part of the U.S.-led coalition,” said Lynn Maalouf, the research director for the Mideast at Amnesty. The Iraqi forces and the coalition “continued to use imprecise, explosive weapons with wide area effects in densely populated urban environments,” Amnesty said, adding that some violations might constitute war crimes. “I reject any notion that coalition fires were in any way imprecise, unlawful or excssively targeted civilians,” he said. “I would challenge the people from Amnesty International or anyone else out there who makes these charges to first research their facts and make sure they’re speaking from a position of authority,” Townsend added. In Geneva, U.N. human rights chief Zeid Ra’ad al-Hussein urged the Iraqi government to ensure that human rights will be respected in post-IS Mosul. Zeid described Mosul’s fall as the “turning point” in the conflict against IS, but warned that the group continues to subject people to “daily horrors” in its remaining strongholds of Tal Afar, west of Mosul, and in Hawijah, north of Baghdad. “Horrific though the crimes of ISIL are, there is no place for vengeance,” said Zeid, using another acronym for the Islamic State group. Associated Press writers Susannah George in Irbil, Iraq; Maamoun Youssef in Cairo; Jamey Keaten in Geneva; and Sinan Salaheddin and Muhanad al-Saleh in Baghdad contributed.